For the past week I’ve been spending some quality time with the Samsung Galaxy Tab 10.1. While I like the hardware for the most part and I don’t mind TouchWiz, I’ve been struggling to find a place for the device in my life. While a large part of it is simply that I’m not entirely convinced that a tablet is the best form factor, I keep finding myself disappointed with the app selection and quality. There are some great apps available for Honeycomb and Ice Cream Sandwich, but overall I’ve been disappointed time and time again. 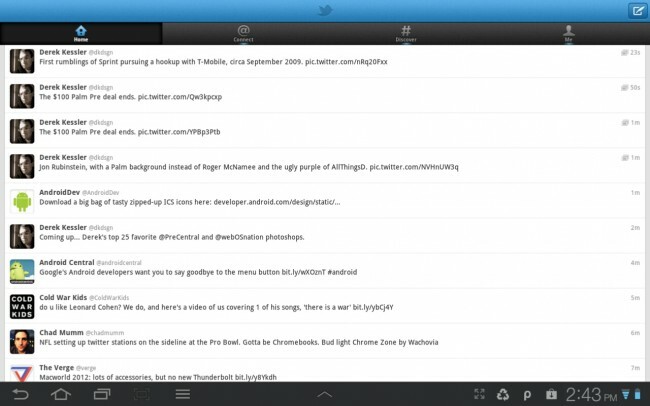 I use Twitter all the time, so having a great Twitter app is important to me. I’ve tried all the apps out there and the official Twitter app remains my favorite (mostly because TweetDeck has become abandonware). Unfortunately, the Twitter team hasn’t taken the time to make the Twitter app optimized for tablets, which leads to the hideous layout above. It’s usable (though very laggy), but I’ve been forced to switch between Tweetcaster, Plume, and Tweetcomb, all of which have issues. Perhaps the most maddening part of the situation is not that there are only three tablet optimized Twitter apps, but that Twitter has a tablet optimized version of their app for iOS. Another major disappointment was Google Docs. The application has a great view for choosing documents, but once you get into typing up a document you’re better off scouring the Market for an actual attempt at a decent app. The Galaxy Tab comes with Quickoffice HD which offers much more functionality (including the option to sync with Google Docs, Dropbox, box, huddle, SugarSync, or mobileme), but lacks some key functionality like inserting a period after two spaces. It really is a shame that Google hasn’t done anything to make Google Docs a usable experience. Sure, there’s always the option to use the website, but I’d rather have a useful app. Apps like Google Music look great on Honeycomb/ICS, but apps like rdio and Google Listen are once again simply blown up apps. Google Listen is the definition of abandonware at this point, but apps like rdio deserve a tablet optimized version (especially since rdio has an app for iPad). Apps like Google Listen and rdio still function properly, but the experience is tolerable at best. Why Google didn’t just push Google Listen into Google Music is beyond me. The stock browser offers decent functionality, but it’s again limited. The browser performed fine for simple sites like Droid-Life, but it had some seriously delay when loading heavier websites like The Verge. Opera had less issues, but Dolphin Browser HD had the best performance of the three. It’s a little disappointing to me that it took downloading a 3rd party browser for me to get a good experience, but I imagine things will improve for the stock browser when ICS is released for the Galaxy Tab. The Netflix app is a great example of the state of Android apps. 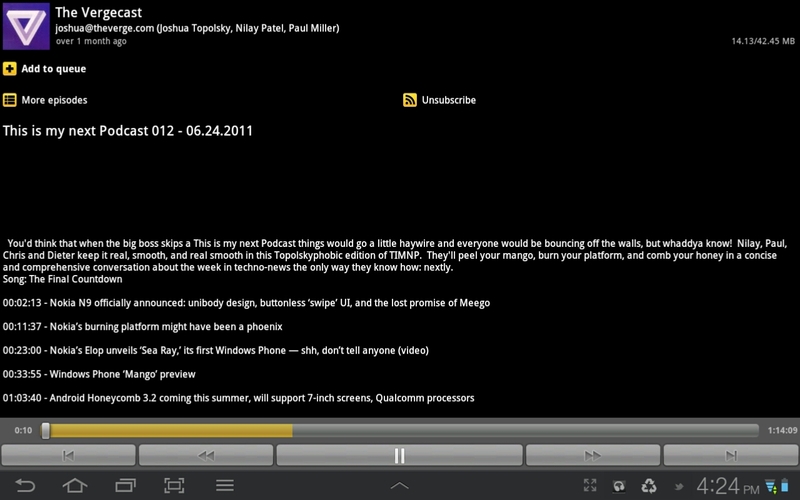 The app works fine on the Galaxy Tab, though scrolling through a list of films is very jittery. Playing actual video in the app was great, but the experience of finding a movie to watch was sluggish. It felt like Netflix pushed the app out just to get it out without any intention of really optimizing the performance for browsing. It’s a minor issue, sure, but if I’m going to shell out four to five benjamins for a piece of hardware, I’d like to have some assurance that the apps available are high quality. Over the weekend I played a little Dead Space on a friend’s HTC Rezound. I enjoyed the experience, so I figured I’d buy the app to play on the Galaxy Tab. Unfortunately, there is no tablet version of Dead Space. I can’t even play the phone version. Many other games like Cut the Rope and Hex Defense are just blown up versions of the app, but there’s little reason to expect a tablet optimized version of those apps. Most games played fine, though many could have used some high resolution images so that they looked better when blown up to fit the Galaxy Tab’s screen. I understand that Honeycomb tablets have only been on shelves for eleven months, but I expected there to be better apps on the Market by now. I know the transition from one screen size to another takes time, but I think it’s clear that most developers simply don’t see the value in optimizing their apps to run on tablets. It makes sense; most tablet owners have an iPad, not an Android tablet. I get it, but that doesn’t make me happy about it. It makes it harder for me to recommend something like the Transformer Prime to clients and friends. Sure, it has a keyboard dock, but without a great market of apps it’s worse off than a $250 Windows netbook. Google needs to start throwing some of their billions at app developers to ensure that major apps like Netflix have a buttery smooth, reliable, fun experience. Just as importantly, Google’s own apps should be optimized for tablets. Gmail looks and works great, but Google Docs is useless. That should never happen. Google’s apps should showcase what developers can do with Android. Google’s apps should number the best in the Market. Right now, many are among the worst available. Ice Cream Sandwich was a great first step in making Android more usable on tablets, but Google has to know how important apps are in this space. There is no excuse for the official Twitter app to not be optimized for HC/ICS, much less for Google Docs to offer such limited functionality. If Google really wants to compete with Apple, that means we need better apps now.